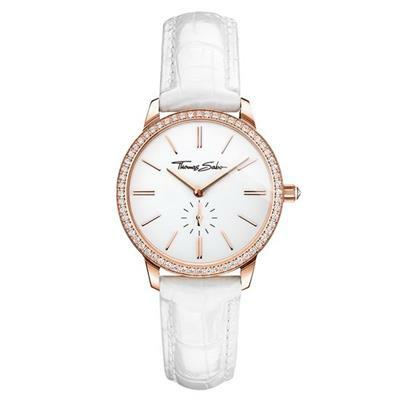 This striking watch by Thomas Sabo features a beautiful combination of rose gold tones and white Cubic Zirconia Pave, alongside a crocodile embossed leather strap. Made from rose gold toned Stainless Steel, with a high shine white dial. The crown of the watch is accented with a White Cubic Zirconia stone. The case is 33mm in size.